Red velvet cake. Colorful chocolate candy. In bite-sized truffle form. Need I say more? This post has been sitting in my queue forever. I made these adorable little balls of joy back in May for my friend Shelby's birthday party (hi Shelby! ), and they disappeared instantly. Combining the cake with the frosting makes a creamy, genuinely truffle-like mouthfeel (side note: I can't decide if I love or hate the word mouthfeel. Trying it on for size here. Thoughts?). I'm still trying to understand the mechanics of candy melts and chocolate bark. I had a hard time getting the coating to look smooth and clean (hence the preschool-like splatters to cover up the messiness). Does anyone have any tips or hints on working with candy melts? I'd love to hear them. They look delicious!! 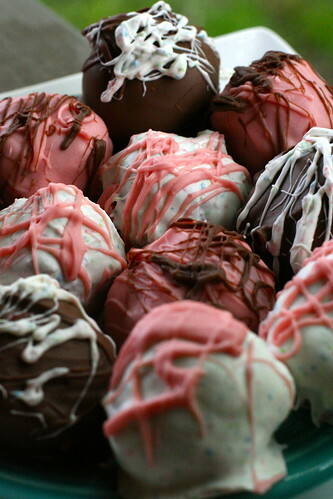 I have a couple of candy melt tips in my latest post about cake pops. I'm wondering if using a skewer or something to do truffles with the same technique would have smooth results. I have never tried dipping without the stick, though. It seems way more challenging. mmm, tasty. i envision making these for christmas! my tip--use a small crockpot to melt the chocolate. that way, it stays wet and workable. Check out Alton Brown's Good Eats on making truffles. He uses a heating pad to get just the right temp. It works much better than trying to do it on the stove top.